When he was a young boy, Afro witnessed his father be cut down in a duel at the hands of a man known only as Justice. After taking the life of Afro's father, Justice cast aside his Number Two headband and took the Number One to claim its godly powers as his own. Years later, having obtained the Number Two headband which grants him the right to challenge the Number One, Afro moves forward in his hunt for revenge on the man who murdered his father. There is just one thing that stands in his way—everyone else in the world! Though the Number One can only be challenged by the Number Two, the Number Two can be challenged by anyone. As his enemies gather to try and take the title of Number Two, Afro must fight through a myriad of foes and obstacles if he hopes to reach the Number One and claim vengeance once and for all. The Afro Samurai anime was a creative collaboration between Samuel L. Jackson, Takashi Okazaki, and Gonzo, with the music scored by RZA of the Wu-Tang Clan. 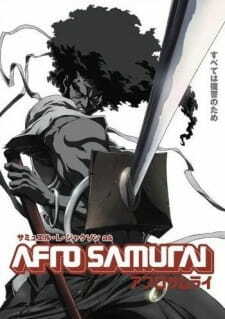 After the success of the anime series it was adapted into an animated film, a video game and received a live action tribute short film titled "Afro Samurai: Flesh and Bone". The anime aired first on Spike TV in the US from Jan 4, 2007 to Feb 1, 2007. 3 months later it aired on Japanese television over in two consecutive night blocks with Japanese subtitles. I watched this series on Spike TV and i must insist this is one of the best dubbed animes i have ever watched! The voice over cast list start off with Samuel L Jackson (pulp fiction, Starwars) and Kelly Hu (X2: Xmen United) two A list actors very famous for their action movies. And their voices get put through the test as they use their voices for multiple characters in the series. And the voices they portray are very believable in my opinion. As in terms of animation value, one only needs too look at their hair and their tattered clothing flowing in the wind just like in a classic samurai showdown of the old days. Everything is very artistic and not to mention VERY gory (which is a plus for me). As expected of a 5 episode series, the story is not very detailed on character backgrounds and side stories except the main character (their website more than explains each character). But, they do throw you in the mix right away. The main character "afro samurai" is the second samurai in the world. And he is on a mission to become the number one samurai in the world. And thats where the story starts, his journey to his headquarters. the verdict? For those who want a quick pick me up action anime that you can finish in one sitting, by all means pick this up! but if youre looking for a super long anime, youre looking in the wrong place. I was told that this was a very stylish, very gory anime. It was recommended several times to me, but when I got round to watching it, I was appalled at the terrible, nonsensical story. First of all, the story as a whole is VERY mediocre: boy loses father, boy gets revenge on fathers killer, etc. It's like something from Daredevil. But the thing that really, REALLY pisses me of is this: he hardly ever fights humans. Seriously. He fights killer robots, humanoids and weird monks (one armed with a bazooka! ), and finally a guy with 3 arms. That is why this series comes off as poor. However, this is saved by the excellent animation with unique styling and excellent sounds. The artwork is great, and the voice acting by Samuel L Jackson adds the extra bad-assery that the show needs. The charaters were pretty bad. You know how I feel about the enemies, but even Afro-Samurai is badly portrayed. He's a 2D character, and the writers thought that if loads of bad stuff happened to someone, I'll automaticly feel sorry for him and be on his side. No, it doesn't work like that. Overall, not a series worth avoiding, but only because it's so short. There are plently of better anime to watch in the mean time. I really had high expectations for this anime, and they were crushed for how bad the story is presented and yeah, Samuel L. Jackson is here but, that doesn't make the anime good, the story and the characters should, not a big movie star. The story is mediocre at best, the story follows a vengeful, full of hatred man named Afro, who saw his father the bearer of the n.1 headband being killed by the bearer of the n.2 headband named Justice just for the sole reason of becoming a god (don't know how a headband will grant you that but...ok) and he tells Afro if he wants revenge he'll be waiting, that's where the 5 eps. anime starts with one problem, nonsensical bulls**t, what happened to the earth? why is technology only used by a group of old guys? why people can only kill the n.2 so they can kill n.1 and not directly? why those headbands are important anyway? or why those thing aren't explained? don't know and i couldn't care less now, it was boring, the only thing they were focused on was the past, in every eps. 15 min. of his past and 3 of action but they forgot the present and the unexplained. It wasn't bad but i didn't like it, it's a combination of western cartoons and anime (like Tokyo Tribe), it was ok. The music was fine, the sound effects were bad, the voice acting was ok because only Jinno and Ninja Ninja (the one with white afro) had good voice acting and Afro (Samuel L. J.) didn't talk much and when he did it was ok.
Mediocre characters, not appealing for me, i felt Jinno more than Afro, other than that, the characters were rushed, needed more eps. to be really good. It was boring, i didn't get why this is liked and popular maybe just because of Samuel L. J. and that's it, i was going to watch the movie but only if i liked this so no movie for me, mediocre enjoyment. When I started watching this anime, I wanted to hear the voices in japanese, thing that I never managed to, because I therefore learned that this anime was an American answer to Japan.... And I'll tell you what, they were very successful, one of the best dubbed anime I ever heard. They managed to fit everything like the art... I mean look at the details of the characters' drawings, their particular portraits, the dark "aura" they managed to bring from this dark world and look at cool gore scenes! A nice fitting music, enjoyable action moments and all in 5 episodes. What about Samuel Jackson's voice coming from Ninja's mouth? It is just... Awesome!! So basically, the story goes around a futuristic feudal Japan where there are two headbands: Headband no.1 and Headband no.2. The fighter who holds the No.1 is considered god-like, the best of the best and can only be challenged by the one who holds the No.2 one. However, everyone, but literally everyone, can challenge the No.2 holder for the headband, meaning lots of trouble for that guy. Afro's father was the No.1 holder and died against a character named "Justice". Seeking revenge, Afro got the No.2 headband and is now heading to where "Justice" is waiting for him. He goes on as some people try to stop and kill him to get the No.2 title and at the same time we learn about Afro's past as he was training to be a great samurai. The fighting scenes are very enjoyable and the story is very simple but it is the typical good samurai revenge story. However, the characters are not that much deeply explored and explained, unlike Afro, but I personally think that it's not necessary in this case. On screen violence is thrilling, exhilarating, and without a doubt makes the adrenaline run and pump through the veins. Here's a list of 10 of the best violent anime to tie your knickers in a knot. They say that revenge is sweet and that it is also a dish best served cold. This also happens to perfectly describe ice cream. Come take a look at characters who are sustained by their vengeance and not just ice cream.